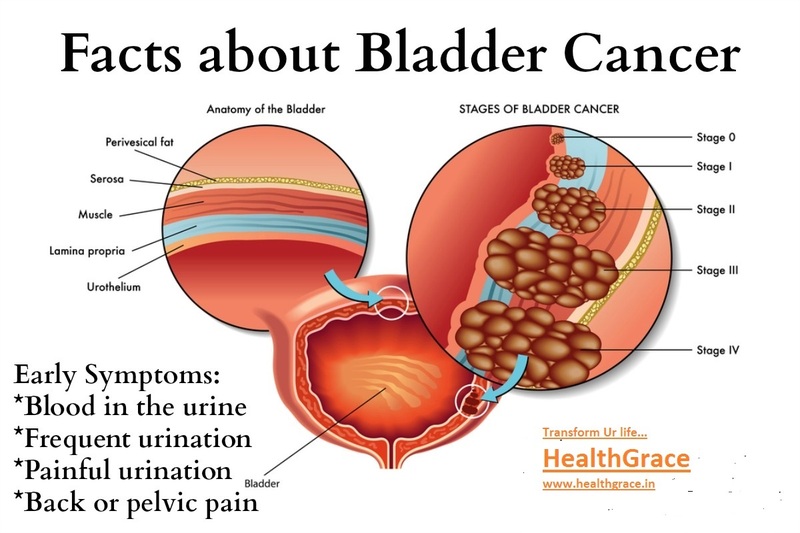 Bladder Cancer is related with urinary bladder. Certain lifestyle changes surely help you to save dying from bladder cancer. Bladder cancer is the growth of abnormal cells in bladder, which is out of control. This Cancer generally start from the lining presence in the bladder of the human body.As cancer is spreading kind of disease, It will also slowly spread through the lining and went into muscular wall of the bladder. this cancer will affect area of body i.e. Kidney, Liver and Lungs.It is related with urinary bladder. Certain lifestyle changes surely help you to save dying from bladder cancer. 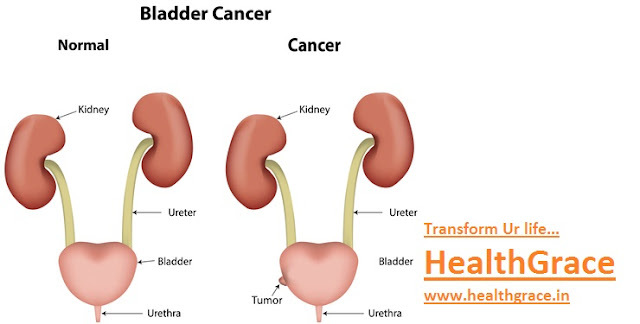 Symptoms of Bladder Cancer: Symptoms means that human body gives when there is any kind of diseases is in your body. Blood in the urine. It is also called Hematuria. Painful Urination: patients will feel pain during urination. Increased Urinary: Urinary will become very frequent. Pelvic, Back and Abdominal Pain: sometimes you will feel pain in the back of your body and also in the pelvic and abdominal part. If you feel or have first symptoms then seek a Urological Evolution. In most of the cases physical activity is a proven idea that may cut the risk of bladder cancer. Stay well hydrated by increased fluid intake is also proven idea for reducing the bladder cancer risk. Fluid intake is also good for overall health. Stop smoking and took regular follow-up surveillance ad testing regimen that your doctor suggest. In brief stages of the bladder cancer my be defined by "TNM". Where T stands Tumor, N Stands Lymph Nodes and M stands Metastasized. Stages show status of the tumor that how far it has spread. Basically bladder cancer is having three stages. T (Tumor): This stage measure grown of main tumor. and its spreading into nearby tissues of body. N (Lymph Nodes): It can be said as groups of cells. it has spread into lymph nodes. M (Metastasized): It is term which describe that cancer cell has spread into lymph or Organs. Doctors used starting letter of i.e. T, N, and M to show stages of cancer. Various therapy are available for treatment i.e. Radiation Therapy, Intravesical Therapy,Immunotherapy. Let's see what basics of all these treatments. Radiation Therapy is a kind of treatment that involves use of radiation. These radiations are very useful to kill cells of cancer. It is very similar to X-ray like treatment but it requires sit-ups in a week like 5 days/week. Immunotherapy is a treatment that uses power of Immune System. In this Doctor externally inject BCG germ (Bacillus Calmette-Guerin) into human body. It is related to tuberculosis process. This activity will draw body Immune cells into bladder and help patient to fight against bladder cancer. Intravesical therapy is a kind treatment that removes those parts of the bladder which is known as partial cystectomy. If all part will be removed then it is called radical cystectomy. It will be Partial or Radical it will depends on the condition of bladder, like how much cancer has spread in the bladder. If maximum part of the bladder has spread then doctor will remove whole part of organ and their nearby lymph nodes. For treatment of the different types of cancer various specialization will be available with many number of vacancy now a days. Last but not the least if you feel any symptoms then contacts your doctor immediately without any delay.